Weekend Family Events for Louisville parents! Fun things to do with kids this weekend. 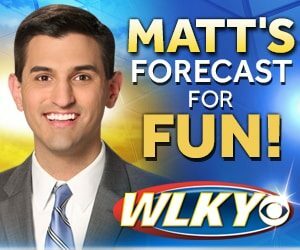 Here, you can find your weekend family fun and weekend events around Louisville! There’s a TON going on this weekend and the weather is looking amazing! Kentucky Derby Festival is rolling with many events as the Derby is approaching quickly. Get outside this weekend! 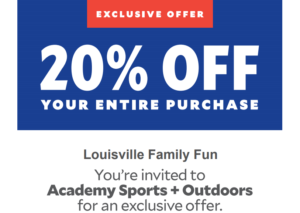 Do some pre-weekend shopping at Academy Sports + Outdoors. We have an exclusive 20% off deal no through Saturday. Get 20% off your entire purchase, excluding clearance items. Show your coupon – here’s more info and a link to the coupon. It’s a great weekend for some fishing or hiking, go get some gear and supplies! What an amazing weekend for a train ride through the Kentucky countryside. The Kentucky Railway Museum is having new themed excursions this weekend – Princesses & Heroes! They have times and tickets available for both Saturday and Sunday so check it out here. Also on Saturday, it’s Spring Fling time in Portland at the community center. From noon -3 pm, there will be games, food, prizes and time to play your favorite sport with Rec On The Go. It’s free! Fan Fest is taking place all day at the Kentucky Derby Museum. They have a FULL schedule of events that will make for fun for everyone in your family. The Junior Jockey Zone is from 10am – 2pm with crafts, story time, learning experiences and more. The fee is their normal admission! $15 for adults, $8 for kids ages 5-14, and free for kids ages 4 and under! Want to see more? Click here for our community calendar of events! Attention! Subscribe to our monthly newsletter. Subscribe here.